Clearly, we are talking about islands today. Kitchen islands. When the house was built in 1985, I’m not sure if the architects envisioned a kitchen island, but in April of 2010, I did. The vast open space consistently said to me “if you build it, they will come.” How could I ignore such an impulse? 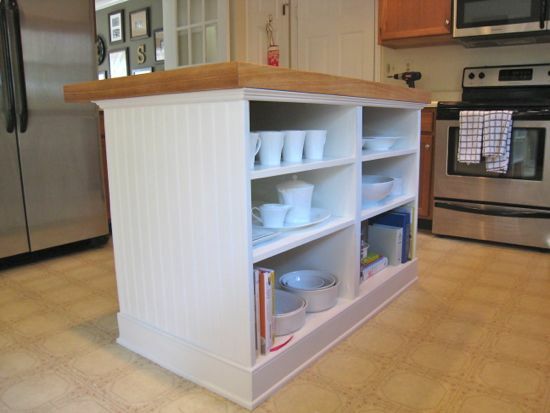 I began researching all the different approaches to building a kitchen island several months ago. There’s a wide range of designs, materials, and of course – costs. 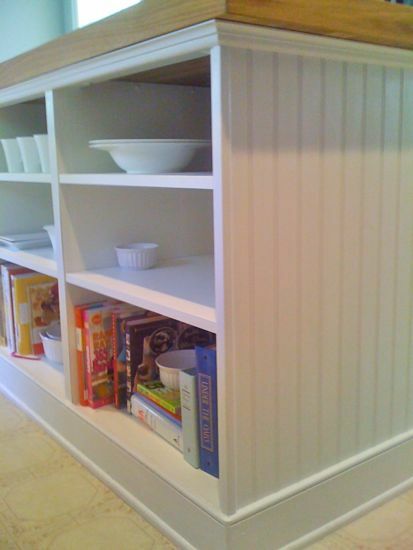 The simplest way that we found was to simply buy a set of base cabinets and then get a countertop made to our dimensions. The picture doesn’t do it justice. 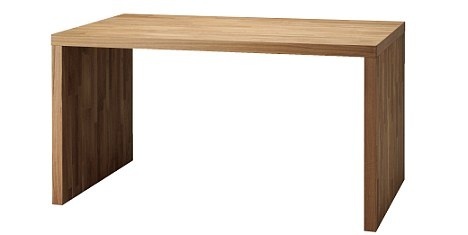 This worktop table is massive. It measures 53” x 33.” Ideally, we wanted a 3’ buffer around all of our cabinets, stove, refrigerator, and dishwasher and this size was perfect. It was modeled with 4 base cabinets underneath it (measuring 30” x 15”D). 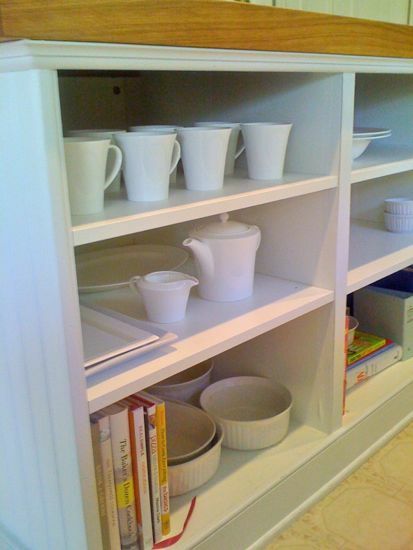 We were able to pick up two very basic base cabinets (at IKEA) with open shelving that measured 30” x 24”D. I forget how much we paid, but I think it was under $100 for both. The original idea was to put together the worktop, slide the base cabinets underneath (flush on one side and stools tucked under on the other side), and then call it a day. We did that….but just hated it. It felt way too large and obtrusive. Plan B. I took it all apart and decided to ditch the oak sides and just trim the cabinets myself. 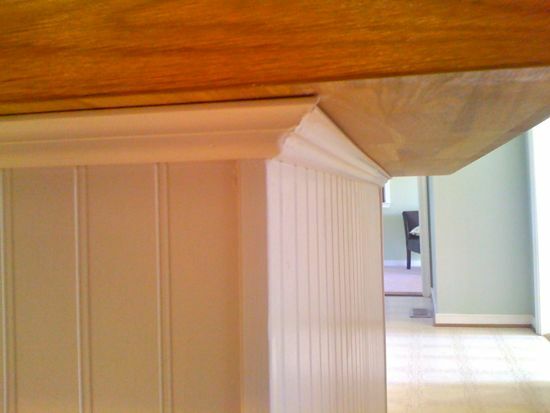 I spent about $70 and bought bead board, crown moulding, shoe moulding, 4” baseboard, and some corner moulding. I got to use my new nail gun (thanks, Mom for the Christmas present) to pop together all the pieces. 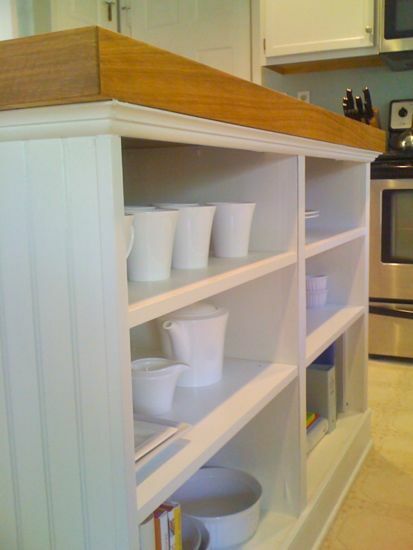 After a fresh coat of white paint, it totally transformed it from some bland base cabinets to a custom built kitchen island. So we built it and now they come. It’s become the central hang out spot for all of our guests. 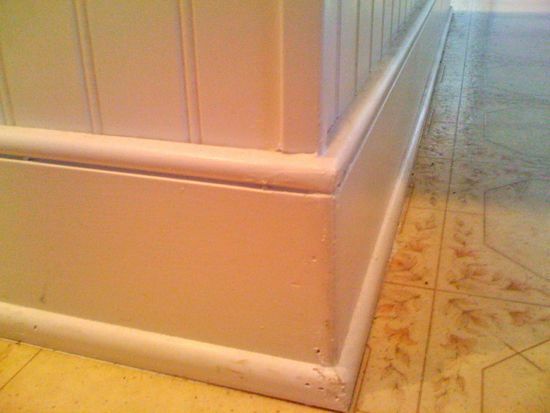 Here are some up close pictures of the trim work.